These wines aren’t the alcoholic jam jars you might expect from California zin. Zinfandel was first planted in California back during the Gold Rush. By the dawn of the 20th Century, zin had become the most widely planted variety in the state. While some of these prized 19th century vines still exist, most were ripped up during Prohibition and replanted with French grapes. After that era, most new zinfandel plantings were sewn in the heat of the Central Valley, where the grape gets overly ripe and makes strong, high-alcohol wine. Today, most of that Central Valley fruit makes us blush, literally (think White Zinfandel). 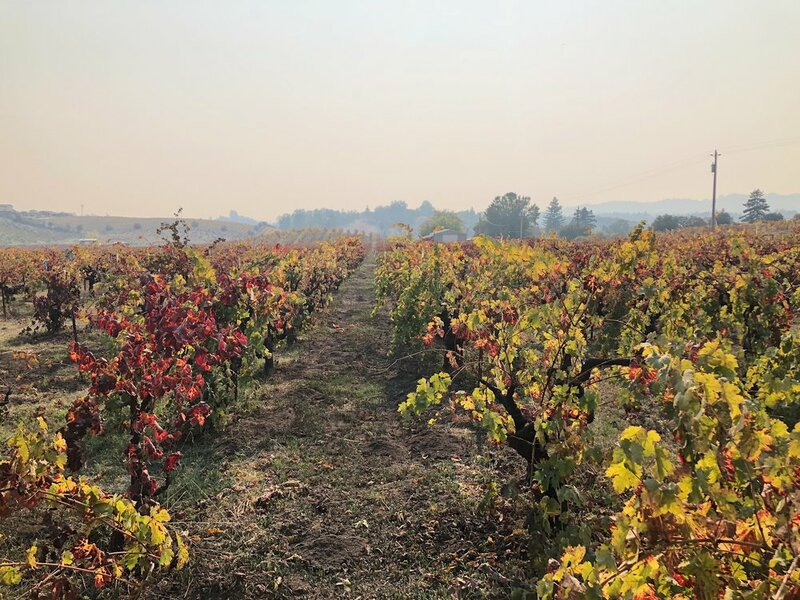 The Dry Creek AVA isn’t as cool and foggy as the Russian River Valley, known for pinot noir, nor is it as warm as the Alexander Valley, known for cabernet sauvignon. Dry Creek is a buffer zone, right “zin” between. Because of Dry Creek’s varying microclimates, soils, and elevations, zinfandel here can be molded to showcase a winery’s individual house character. The region benefits greatly from a diurnal shift of temperatures with foggy cool mornings and sunny, warm days. On days in July, the temperature can change over forty degrees fahrenheit. Dry Creek offers both bold expressions from large wineries, like Gallo, and collectible, age-worthy wine made by tiny-production family producers like A. Rafanelli. The business remains in the family after four generations of winemaking in Sonoma County. The oldest vines are Americo Rafanelli’s zinfandel plantings from the 1950s. When the Rafanelli winery moved to the current Dry Creek location in 1952, there wasn’t much winemaking going on around Healdsburg. Now, the AVA has over seventy wineries, most focusing on zinfandel. Rafanelli still retains a character unique among Dry Creek producers. You can only get their wine from their mailing list (with years of waiting to make the cut), or at a select group of restaurants that run through their allocations quickly. It’s not just their refusal to commercialize that makes their wine different. It’s their refusal to commercialize their wine. If zinfandel is supposed to be jammy and brash no one ever told the Rafanelli family. Theirs has earned a reputation for unusual balance. Grapes are planted on steep terraces overlooking the winery. Rafanelli famously pours their zinfandel before their merlot in the tasting room. It’s a testament to their unusually balanced expression of the fierce red. Their moderate alcohol zinfandel spends eighteen months in second or third-use French oak barrels and is bottled unfiltered. The style of softer, more savory zinfandel isn’t just unusual for California, it’s unusual for zinfandel worldwide. Even Italian (or Primitivo) and Croatian zinfandel tends towards a more fruity profile, and rarely receives reserve-worthy cellaring. Dry Creek feels as old-world as the Old Country. There still aren’t any traffic lights in the AVA, and there is hardly a storefront, other than wineries. Several other Dry Creek producers have developed expressions of zinfandel with lower alcohol, and more structure. The most delicate zins in the region might be those of the Nalle Winery, founded in 1984. Even back in the eighties, Dry Creek was relatively unknown, and Nalle helped the regional zinfandel form its identity as a unique American wine. They still keep their elegant old vine zin under 14% alcohol, and age it for around two years in French oak. The Wilson Winery belongs on the list of Dry Creek icons as well. The Wilson family has been farming in Dry Creek since 1993. Their roster of zinfandel sites is a wide cross section of the AVA from Healdsburg, right up until the Alexander Valley line. They also farm the vineyards used in Mazzocco Wines, another one of the Dry Creek’s stand-outs. Mazzocco is right next to Lytton Springs, perhaps of the most important vineyards for Zinfandel in the U.S. They bottle wines from this game-changing site, but Lytton Springs is better known as the second home for Ridge Vineyards. The winery was started in 1959 by Dave Bennion, Hew Crane, Charlie Rosen, and Howard Ziedler, engineers working at the Stanford Research Institute. They started their first estate, Montebello, in the Santa Cruz Mountains. Starting from a quarter barrel of Montebello Cabernet Sauvignon, the hobby winery turned serious after they were surprised at the depth of their first vintage. In 1962, Dave bonded the winery and left S.R.I. to become a full-time winemaker at the newly established Ridge Vineyards. Ridge were among the first proponents of old vine zinfandel, working with the grape starting back in 1964. Ridge began making wine from their Dry Creek vineyard, Lytton Springs vineyard in 1972. They continued with it until they eventually bought the estate outright in 1991. Their zinfandel is the opposite of what you might expect from a winery founded by technical academics. It is vinified using non-interventionist methods to allow the vintage and the land to express its unique qualities. Native yeast fermentation and minimal sulfur additions keep Ridge wines a bit unpredictable, and expressive of vintage. Ridge’s approach to winemaking is different from most others in Dry Creek. They use a blend of new and used American oak barrels to condition their wines. For them, it’s the right wood for Zinfandel and creates a fully native expression of America’s grape. Their vineyards too are different from the high terraces of Rafanelli. Lytton Springs is wide open with gentle hills, or benchlands, sparsely planted with bush-trained vines. The wine from this vineyard is a classic example of how well Zinfandel folds into a field blend. This wine blends zinfandel with the grape’s dancing partner, petit sirah, as well as carignane (carignan), another once-common grape in California that has seen fortunes waver over the decades. In addition to these main partners, the vineyard is planted with several other varieties and even some white grapes. All grapes are harvested and fermented together. Many of California’s oldest zinfandel vineyards are planted like this, with various varieties intermingled, rather than set in separate, organized rows. This one is a 100-years old and was planted, by design, for field blends. Dry Creek has few remaining vineyards like this, which is part of what makes Lytton Springs so remarkable. Ridge’s other Dry Creek vineyard, East Bench, is at the Northeast edge of the appellation. It is re-creation of California’s classic zinfandel vineyards. The winery planted the vineyard in 2000 from selected cuttings from some of the state’s oldest zinfandel vines. The bush-trained vines planted on the East Bench resemble those in Lytton Springs. However, unlike Lytton Springs, this vineyard is on iron red soils, with young, vigorous vines and is 100% planted with zinfandel. The wine is darker, the fruit is juicier, and the savory qualities are slightly muted. The acidity and tannin are subdued compared to the Lytton Springs in the same vintage, but the wine is no less enjoyable. These are the future old vines of Dry Creek zinfandel. Whether planted on steep hills or rolling bench, or vinified in French or American oak, Dry Creek Zinfandel has a distinct character. From either young or old vines, the wines can have great depth. The grape adapts well to both traditional and modern winemaking techniques. It makes bold varietal wines, or it can provide the backbone for graceful field blends. The key ingredients are gentle temperatures and producers that truly believe in the grape’s potential. Dry Creek offers both of these in abundance.